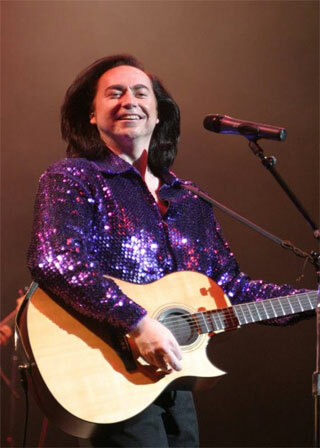 A "Legend" was born when Bobby's incomparable talent for impersonating Neil Diamond was realized in Toronto, Canada. A child model and actor, Bobby was a successful musical theater performer when he donned his first sequined shirt. Since, Bobby's career as a tribute artist has exploded. His incredible showmanship has rocked crazed crowds around the globe. Bobby's phenomenal talent caught the attention of the world-famous Legend's in Concert in Las Vegas, and so Bobby brought his "Diamond" performance to entertainment capitals across the U.S.A. But word had spread, and Bobby was once again whisked away - this time to Neil Diamond's greatest market - Australia. Over 30,000 people across the Australian continent couldn't get enough of Bobby's astounding passion and energy. The demand for Bobby's thrilling re-creation of the music and magic of Neil Diamond has taken him to many exotic locations throughout South East Asia. Whether to a crowd of 20,000 at Toronto's SkyDome or at a Gala Performance for the King and Queen of Malaysia, Bobby's spectacular voice and charisma wins fans around the world. With his star still rising, Bobby looks forward to further expanding his extensive audience base in national and international markets with his sensational all-new show "Songs of Life". "For Neil Diamond fans, or just fans of live music, the "Nearly Neil" show is a must. Bobby Bruce is a dynamic entertainer, who has created his own performance based on Diamond's music." "The dance floor was packed all evening and our people were blown away by the talent on stage! I had to convince many of them that you were actually singing, not lip-syncing, I can honestly say you're as good if not better than the real thing!" Noteable Entertainment & Events is a Vancouver based booking agency, party rental, entertainment services and event production company. If you are interested in booking Nearly Neil please contact us.